The Stein Collect is at the San Francisco MOMA. I tell you that it was a very stimulating visit. 2.5 hours of Matisse and Picasso, Juan Gris and the Parisian Avant-Garde. I got to understand so much about the Cubist Picasso and Juan Gris. It was a window into the artist mind and a very interesting tour. I will get great inspiration for hat making, well not like the one on the picture, but definitely getting bold in colors and forms. 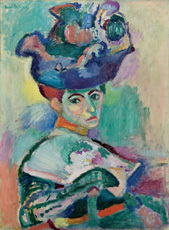 This picture was Matisse's wife, but she was wearing all black, yet he saw her in colors. What was bold about this picture was the idea of using colors like these to paint a lady at the time. Today we think nothing of it, but then it was a shock. I want to thank the Steins for having the foresight in collecting these pieces of art to share it with us. There were other Picasso's and even though I have seen three or four different exhibitions from Picasso, it is always nice to see different works by the man, from bronze to ceramics he had a vision. If this happens to go by your city , go and see it, it is worth it. Thanks for stopping by.